If Florence Nightingale is the patron saint of all nursing, certainly the single most renowned nurse in Methodist Hospital's first century of service is Edna Fagan, a minister's daughter who entered Methodist's nursing school in 1935 and served the hospital with dedication and excellence until her retirement as vice president for nursing services 44 years later. When Miss Fagan retired in 1979, she was replaced by two people. The daughter of a Methodist minister, Edna Alice Fagan was born in Springfield, Nebraska, in 1914. Schoolwork came so easily that Miss Fagan's time in the primary grades was cut short by two years. She graduated from high school at 15. At her father's summer church camp, she met two new role models: camp nurses who were recent graduates of the Methodist Hospital School of Nursing. She enrolled there in 1935. Her father paid the school fees, a full $50 for three years of instruction, books and uniforms. Miss Fagan and her freshmen classmates were immediately put to work on the floors. The freshmen worked six and a half days a week, and mainly the students did just what the registered nurses did: they gave physical care to the patients. They brought meal trays, they scurried about with the bedpans, they fluffed pillows, bathed the patients, wrote notes and provided back rubs. It was a time when both surgical and medical patients spent most of their time in bed. And a "must" for all of them was the morning bath, given in bed. The nurse would uncover a leg and wash it. Uncover the other leg and wash it. Wash the patient's chest, roll him over and wash his back, then give the washcloth to the patient and let him wash his face and stomach. This was followed with a back rub. According to Miss Fagan, as years passed it remained difficult to convince the public that quality nursing does not include a daily bed-bath. For the long-term patient, the bath was followed by a rub with cocoa butter to keep the skin from breaking down. "They smelled like a Hershey bar when we were finished," Miss Fagan said. Well-to-do patients occasionally received special favors. Miss Fagan recalled one patient, a banker's wife, who liked Royal Ann cherries stuffed with peanut butter. The task of pitting the cherries and stuffing them fell to freshman Fagan. "They were pretty good, but not worth the trouble," said Miss Fagan. Floor nurses and the instructor kept a close watch on the quality of care given by students. "If the patient's hot and moist packs were neither hot nor moist, you could count on either the head nurse or the physician sending for you to find out why," said Fagan. "if you forgot to chart or went home exhausted without charting as completely as you should have, the telephone in the dorm would ring and you received orders to return to the unit to finish whatever you had not done satisfactorily." After receiving her registered nurse's pin in 1938, Miss Fagan considered herself fortunate to be hired by Methodist at $60 a month plus laundry of her uniforms and meals while on duty. A month after she was hired, everyone in the hospital took a 10% pay cut. She went on night duty for $75 a month, and then, as a supervisor, took a shift from 6:30 p.m. to 2:30 a.m. for $100 a month. Miss Fagan became the school's single instructor in 1943. She was responsible for attending the doctors' lofty lectures and conveying pertinent information to the students. At the time, her approach was innovative. "I taught by symptoms," Miss Fagan explained. "The State Board of Nursing didn't like my way, but our nurses learned more than just what to do. They learned why." In 1946, Miss Fagan was named the Supervisor of Nursing. She was the head of nursing services for both Methodist Hospital and its School of Nursing. Shortly thereafter, more nursing instructors were added to the staff. "Dear Friend: Expert nursing care saves lives. Certainly it does. But much of a nurse's duties are not related to saving lives. It is a wonderful feeling when it does, but what of the rest of the time? Always she does much more than meet the patient's physical needs. There is Mrs. Brown who has left a family of small children at home. She cannot get well while she worries about their care. Who helps her meet her problem? Mr. Jones has heart disease. He cannot return to his work to support his family. Who helps him to adjust to his new life? Johnny is lonely and afraid. Who holds him close and assures him that all will be well? You know the answer. These are the everyday tasks of a nurse. She gives gladly of her skills, her knowledge, her love and herself." Through the years, the school's faculty constantly reviewed the curriculum, making changes as medical technology and knowledge expanded. In 1961-62, freshmen studied anatomy and physiology, microbiology, communication skills, mental hygiene, sociology, psychology and chemistry, in addition to Dynamics of Nursing I and II and religious education. Methodist expanded its arrangement with the University of Nebraska at Omaha to make four-year degrees available to students who wanted to pursue a degree. The hospital continued its three-year diploma program until 1987. In 2001, Methodist's 110th anniversary year, Nebraska Methodist College presented Miss Fagan with a Lifetime Achievement Award, honoring the nursing excellence that was the "life's work and great gift of Edna Fagan." 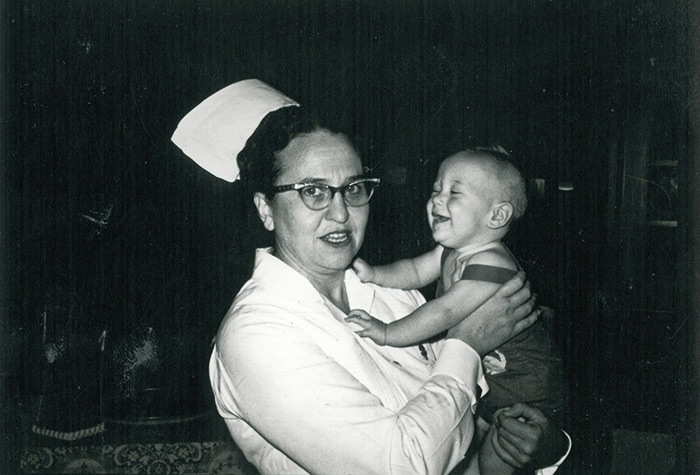 Over the course of her long association with Methodist Hospital and Nebraska Methodist College, Miss Fagan was a student, staff nurse, night nurse, director of the School of Nursing, Methodist vice president, alumni outreach advocate and national speaker. She shepherded the School of Nursing through decades of intense cultural and technological change. She spearheaded professional faculty development, donating initial funding for the first distinguished professorship which was later named in her honor. She was an early proponent of diploma education who laid the groundwork for the eventual shift to a baccalaureate program. Over the course of her career, Miss Fagan oversaw the education of more than 2,000 nurses. In retirement, she continued to be an enthusiastic and involved supporter of Nebraska Methodist College. 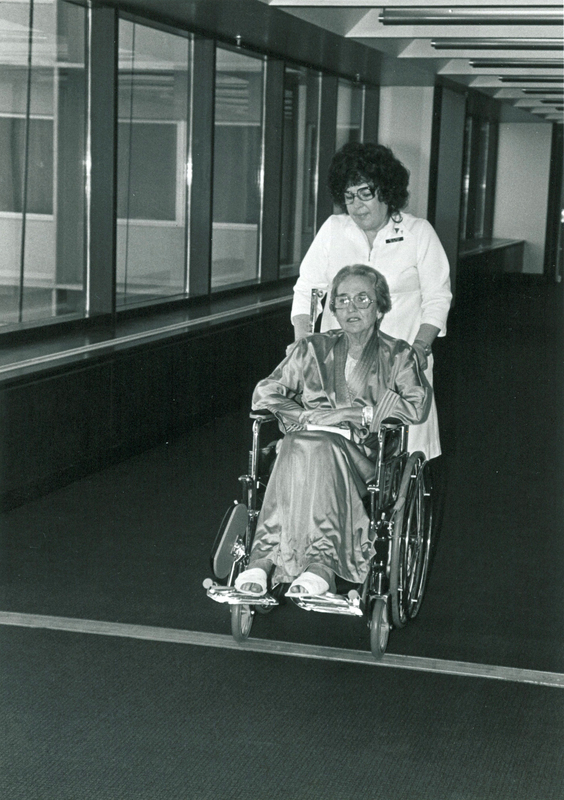 At Miss Fagan's retirement dinner, the announcement was made that the connecting passageway between Methodist Hospital's two towers on 3rd floor, then home to the educational unit, would be named in her honor. The passageway was not included in the original design, only passageways for floors 4 through 9. The passageway on third floor was built "with persistence from Miss Fagan." The "Fagan's Way" third-floor passageway was dedicated in 1981. Shown at right, Miss Fagan was the first patient in the new tower. Also in 1981, the National League of Nursing awarded Miss Fagan the organization's highest honor, naming her Nurse of the Year. Miss Edna Fagan passed away in 2005 at age 90. Sources: "A Century of Medical Miracles: Nebraska Methodist Hospital (1891-1991)" ©1991 by Hollis J. Limprecht and Nebraska Methodist Health System; Nebraska Methodist Hospital News, Volume 50, Number 2, June 1950; The Graduate, a publication of the Methodist Hospital School of Nursing Alumni Association, April 1980, "Forty Years of Dedication to Nursing: Edna Fagan"; The Graduate, a semi-annual publication of the Nebraska Methodist College Alumni Association, Spring 2001, "Fabulous Four"; The Graduate, Spring 2004, "Miss Edna Fagan Will Turn 90."